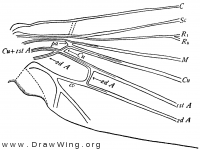 Wings of Limnephilus submonilifer redrawn from Schmid (fig. 325). 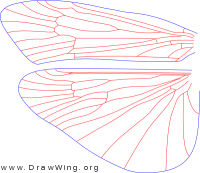 Wings of Rossiana montana redrawn from Schmid (fig. 260). 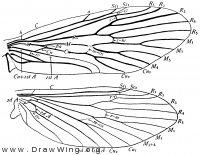 Wings of Arctopsyche ladogensis redrawn from Schmid (fig. 113). 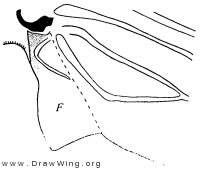 Fore wing of female of Beroea fotana redrawn from Schmid (fig. 650). Hind wing base of Mnemonica. From Comstock (fig. 327) . Fore wing base of Mnemonica. From Comstock (fig. 326) . Wings of Mnemonica. From Comstock (fig. 324) . Fore wing base of Rhyacophila fuscula. From Comstock (fig. 323) . 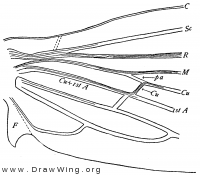 Fore wing of Hydromanicus dilatus. From Comstock (fig. 322) . 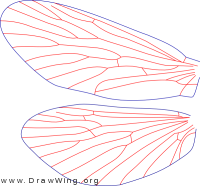 Wings of Rhyacophila fuscula. From Comstock (fig. 320) .